The Toronto Real Estate Board announced strong year-over-year growth in condominium apartment sales in the third quarter of 2015. Sales were up by close to 11% to 6,586 compared to Q3 2014. New listings entered into the System during the quarter and active listings at the end of the quarter were also up on an annual basis, but by a lesser rate compared to sales. “The condominium apartment market segment has been a key contributor to overall growth in GTA home sales this year. With continued sales growth expected in the fourth quarter, we are on track for a new record in condo transactions through TREB’s MLS® System this year,” said TREB President Mark McLean. “As the absorption rate for condos accelerated over the last year, tighter market conditions have resulted in sustained price growth,” continued McLean. Annual growth in the average and median selling prices and the MLS® HPI Benchmark for apartments exceeded the annual rate of inflation in the third quarter. 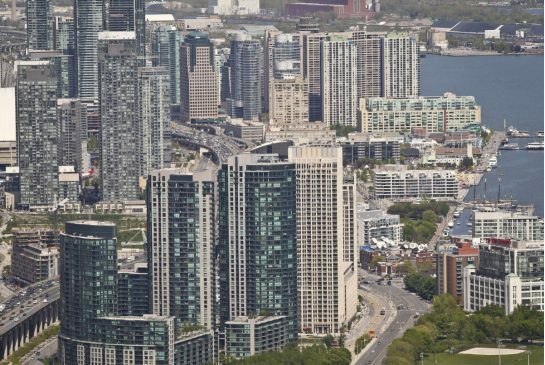 For the TREB market area as a whole, the average selling price for condo apartments was up by 5.4% year-over-year. The median selling price was up by 4.4%. The MLS® HPI Benchmark for apartments was up by 5.6% at the end of September. “The condominium apartment market has certainly benefited from an increase in the supply of listings over the past year. However, through the first three quarters of 2015, growth in sales has actually outstripped growth in listings. This suggests that there was a certain amount of pent-up demand for condominium apartments. As new projects have completed, investor-held units listed for sale have been absorbed very quickly by end users, to the point where price growth has remained strong,” said Jason Mercer, TREB’s Director of Market Analysis.